The amazing line-up of bronzer choices includes four more standard, one colour bronzer shades - three of which are matte, and then four more jazzy shades which are a combination of colours blended together with shimmer and highlight. Their boxes are all colour coded so you can see which bronzer is inside, and the actual bronzer casing is super sturdy. I wouldn't usually take a bronzer with me on the go, but as these come beautifully packaged in great mirrored compacts, and it makes me feel like taking them out and showing them off! All of these bronzers have such a great texture to work with - they blend so easily, and are very pigmented, so a little is enough and you can build up the colour intensity to suit you. 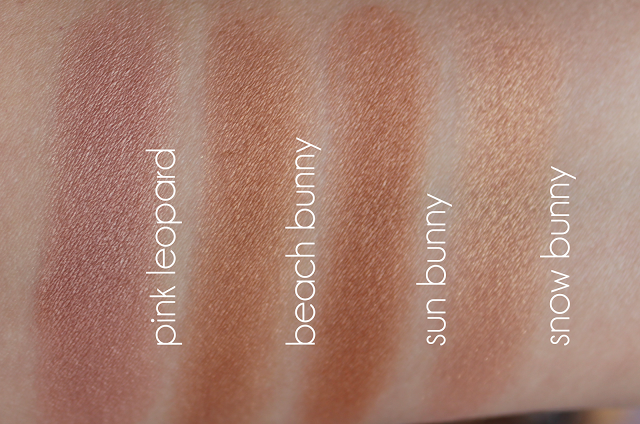 Let's start with the 'bunny' bronzers - aren't they all beautiful? Pink Leopard in particular looks like such a stunner in the pan that you both can't wait to swirl your brush in there as well as being tempted to keep the blush pristine forever just to look at it! Pink Leopard gives the more pinky-toned and I'd say the boldest bronze as it mixes pink, a light to medium and a very dark bronze colour. I've used this one mainly on the tops of my cheeks as a bronzy-highlighty-blush hybrid, and it looks lovely. 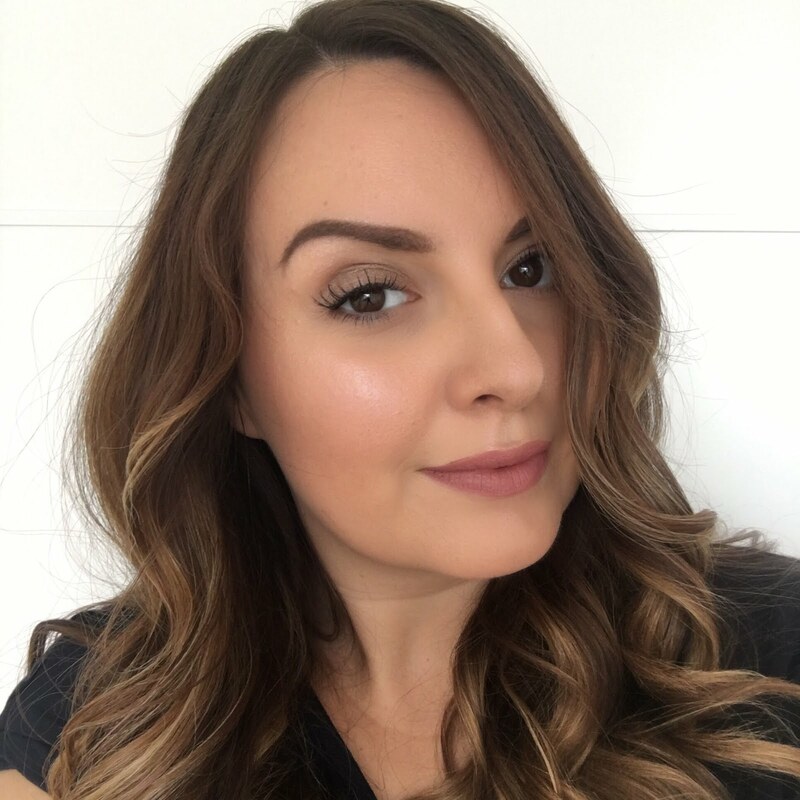 Beach Bunny gives an awesome glow to the skin whilst really warming everything up - it's going to leave you looking majorly sunkissed with three varying shades of bronze and a golden tone. I've had to employ a pretty light hand when using this one as it's so easy and tempting to over-do it. 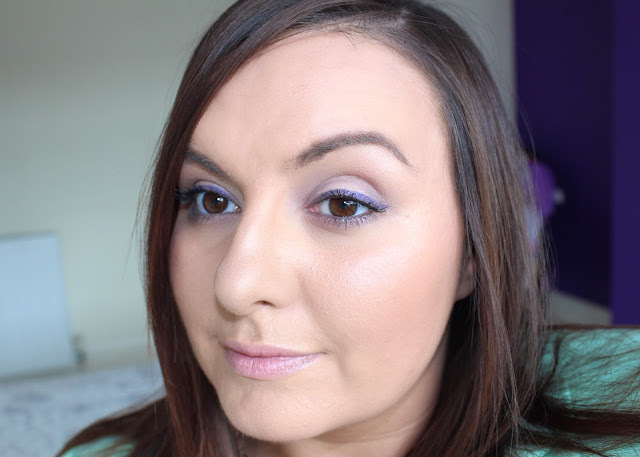 I love this one applied on all of the high points of the face where you'd naturally catch the sun. 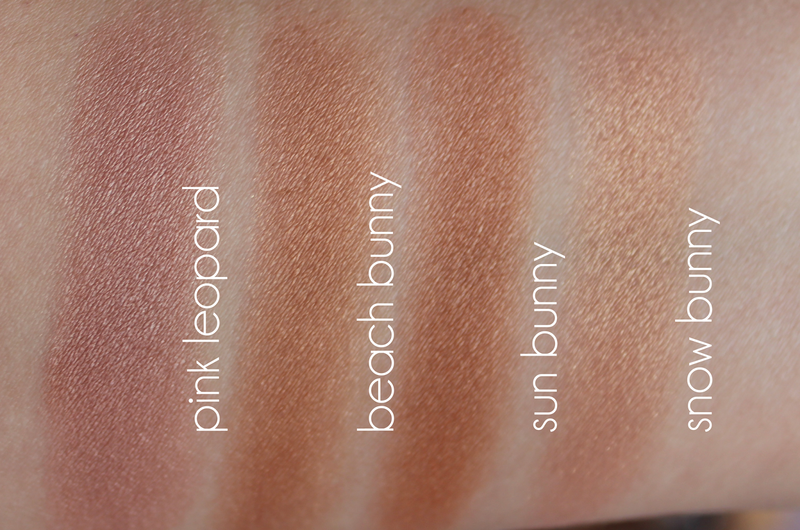 Sun Bunny is the most natural of the four with two light to medium shades of bronze, and although it's looking very similar to beach bunny in my swatch, it does give a lighter and more subtle bronze. I've worn this one just on its own on my cheeks and also generally across all of the high points. I think this one would look really good in winter when you still want to look glowy and sunkissed, but not totally out of tune with the season. If you're a bit nervous about giving one of these bronzers a try, Sun Bunny is a safer place to start. Snow Bunny - ahh the nostalgia. When I first owned this I'm pretty sure I had absolutely no idea how to apply it, but thankfully I've read a lot of blogs since then! I think this one is still possibly my favourite - it has more cool toned shades including a white and pink pixed in with the bronze, and it gives a lighter and brighter type of bronze shade which is aimed to mimic that glow you'd pick up schwoooping down the slopes. I wear this one where I'd catch the sun too, and it gives such a pretty golden glow with a cooler tone. In this second set of swatches we have the three chocolate bronzers (which smell like chocolate by the way - you must sniff them) and the endless summer bronzer. 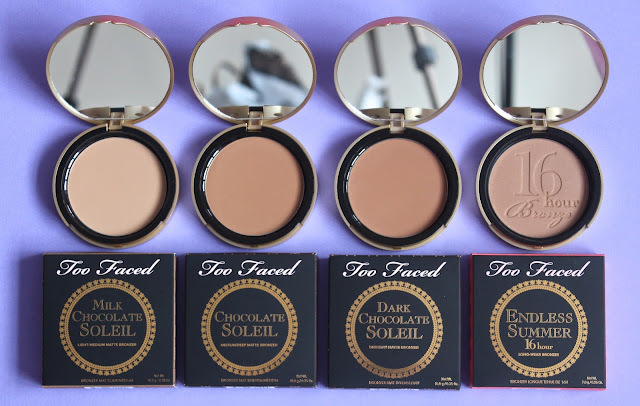 The three chocolate bronzers - milk chocolate soleil, chocolate soleil and dark chocolate soleil are all matte, so you can use them for both bronzing and contouring however you like. They range from light to deep, so you have a variety for different skin tones, or for different effects. They all show up really well on my skin tone, and even the darkest one isn't too dark on me for contour, so I can mix and match them depending on what look I'm trying to achieve and what other makeup I'm going to be wearing. 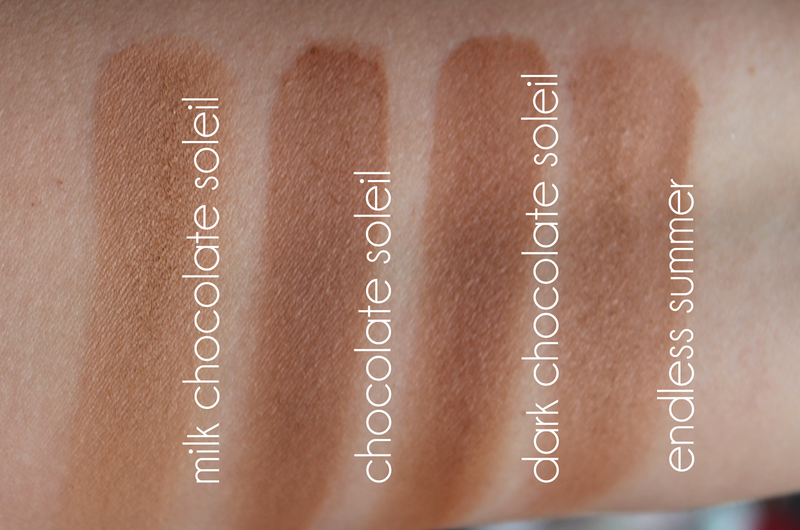 They all blend really, really easily, so they're perfect for contouring. I've used these both with the Too Faced retractable kabuki brush, for an all over bronze, and with my Real Techniques contouring brush for detail such as contouring the hollows of my cheeks or sides of my nose. And lastly The Endless Summer bronzer is a little bit extra special and different. It boasts a 16 hour wear time, and is Too Faced's longest lasting bronzer. I'd say it's quite similar to the Chocolate Soleil in colour, but it also has some shimmer mixed in. The shimmer means you may not want to use it for contouring, but it's a beautiful bronzer for giving long-lasting warmth to the face. 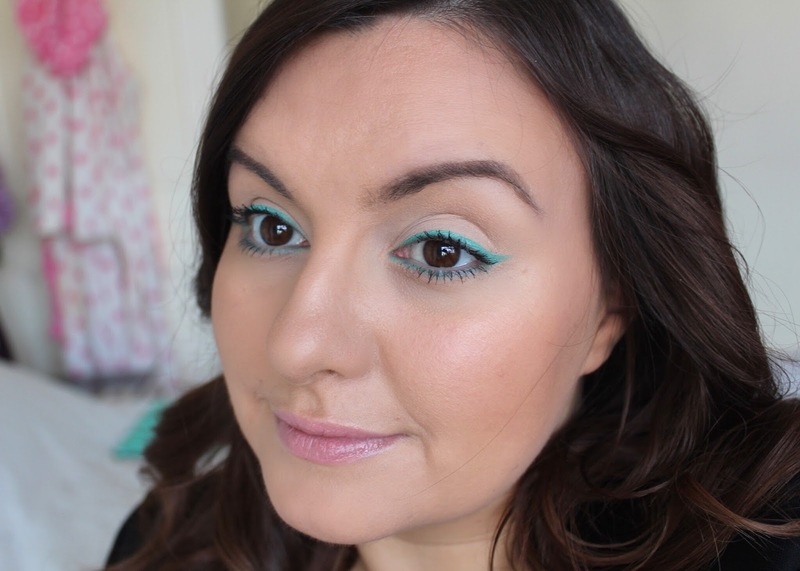 Here I'm wearing the Milk chocolate soleil as a contour and sun bunny on my cheeks and down my nose. 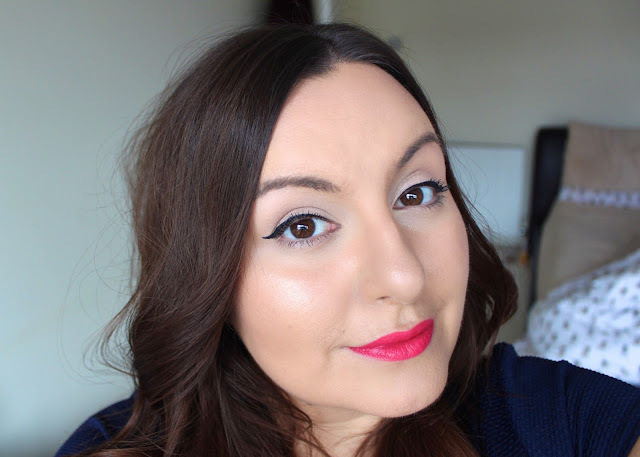 As a red lip and lots of liquid liner can be quite a bold look, I chose to pair it with two of the slightly more subtle bronzers. This looks a little like a lesson in what can happen if you apply too much bronzer, but actually it's just the light - it looked fine in real life, but I was super bronzed. This is Chocolate soleil used to contour and beach bunny kind of all over. And lastly I'm wearing the Endless summer bronzer where I'd catch the sun, topped with a little snow bunny to give some glow, and then I added a little pink leopard to the cheeks instead of blush. I'm wearing the Too Faced Sugar Pop palette on my eyes in these images, and I'll be sharing that little beauty on more detail very soon. I feel so grateful to have all of these beautiful bronzers to play with and it's really changed my makeup routine now that I'm not just grabbing the same contour shade every day and am actually considering what kind of bronze or contour shade will work with what else I'm wearing. Which Too Faced bronzer is your favourite?